The best marketing strategies are simple and direct. They focus on the personal connection and conversation. Virtually all of your clients hire you because they know you already. All you need to do is spark and interest and initiate a conversation to move them forward so they hire you. 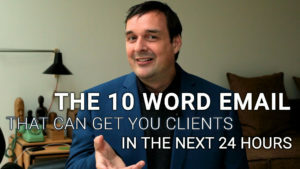 Today’s video shows you a beautifully elegant and simple marketing strategy you can implement right away to get more clients.